Write Articles and Advertise other sites and your Apps! Ad images in the articles! 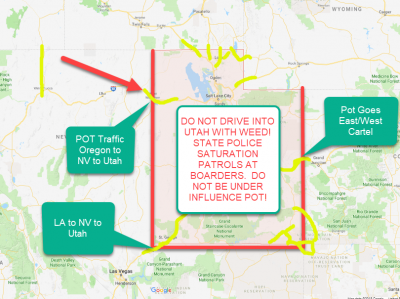 Avoid Bringing Cannabis into Utah at all Cost! Vacation in the west can be harmful to your freedom if you travel into a state that has anti cannabis laws. One such state is Utah! Rule: Never bring Cannabis into UTAH from Nevada - New Mexico - Oregon - Colorado! The UTAH STATE POLICE track entry of vehicles into the state and usually profile cars from CA - NV - NM - CO that are traveling North. 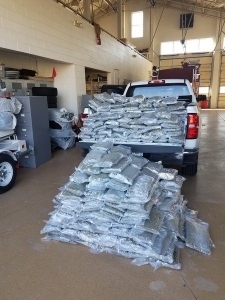 Utah Highway Patrol troopers on Monday seized more than 300 pounds of marijuana on Interstate 80, the state Department of Public Safety (DPS) said. Read More. About 7:30 a.m. Monday, a UHP trooper stopped a pickup truck on I-80 at milepost 158 — several miles south of Coalville — for making an improper lane change, according to a DPS news release. After speaking to the driver, the trooper became suspicious of criminal activity. In his conversation with the driver, the trooper was made aware the pickup truck was a rental from a third party, the news release said. We offer a map of hot areas for retail cannabis users that forget to dump/smoke weed in the car. UTAH gives no one a break! Beware. We have several connections with attornies in Utah that can help you. They are not commonly known on the web. 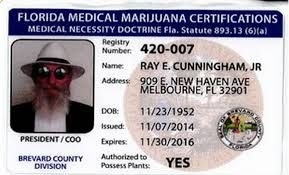 If you want use one of these super connected Cannabis lawyers contact us via help on the site with your situation and we will get the legal representatives your name to contact you. The map below shows the saturation zones for pulling you cars over for any minor violation and searching them. The trooper deployed his K-9, which gave a positive indication of a drug odor coming from the vehicle. The trooper then found 356 pounds of marijuana in the bed of the truck. According to State Bureau of Investigation agents (SBI), who are conducting the investigation, the marijuana originated in Northern California and was headed to Minnesota, the news release said. SBI agents estimate each pound of the drug would have sold for $2,500, for a total of about $890,000 for all 356 pounds. The investigation is still active. No further information is available. Possession of 1 ounce - 1 pound is a class A misdemeanor punishable by a maximum sentence of 1 year imprisonment and a maximum fine of $2,500. Possession of 1 pound -100 pounds is a third degree felony punishable by a maximum sentence of 5 years imprisonment and a maximum fine of $5,000. Possession of 100 pounds or more is a second degree felony punishable by 1-15 years imprisonment and a maximum fine of $10,000. The sale of any amount is a second degree felony punishable by a maximum sentence of 5 years imprisonment and a maximum fine of $5,000. The sale in the presence of a minor or within 1,000 feet of a school and other designated public areas is subject to increased penalties. Cultivation in Utah will be punished based upon the aggregate weight of the plants found. See the "Possession" section for further penalty details. Hashish and concentrates are schedule 1 controlled substances and fall under the definition of marijuana. Possession of paraphernalia is a class B misdemeanor punishable by a maximum sentence of 6 months imprisonment and a maximum fine of $1,000. The sale of paraphernalia is a class A misdemeanor punishable by a maximum sentence of 1 year imprisonment and a maximum fine of $2,500. The sale of paraphernalia to a minor is a third degree felony which is punishable by a maximum sentence of 5 years imprisonment and a maximum fine of $5,000. Avoid arrest in Utah for weed transportation. It is very good read.